Final project for my Intro to Graphic Design class, a repeat pattern design of six squares inspired by the song “Home” by Edward Sharpe & the Magnetic Zeros. This design is inspired by “Home” by Edward Sharpe & the Magnetic Zeroes, a very cute, conversational song about a couple’s love for each other. The tone of the song is light and the message is simple; no matter where they go, they are home when they are together. 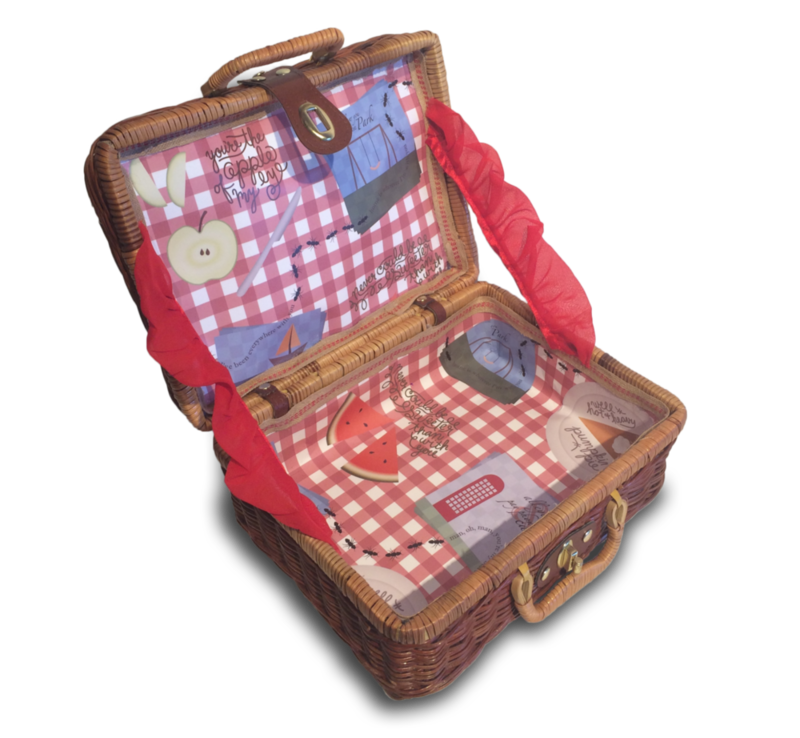 A picnic is a great representation for this concept because it is a romantic yet innocent way to spend time on a portable setting that can be packed away easily. There is a trail of ants following each other through the scene, symbolizing the journey of the couple that moves around a lot but always stays together. 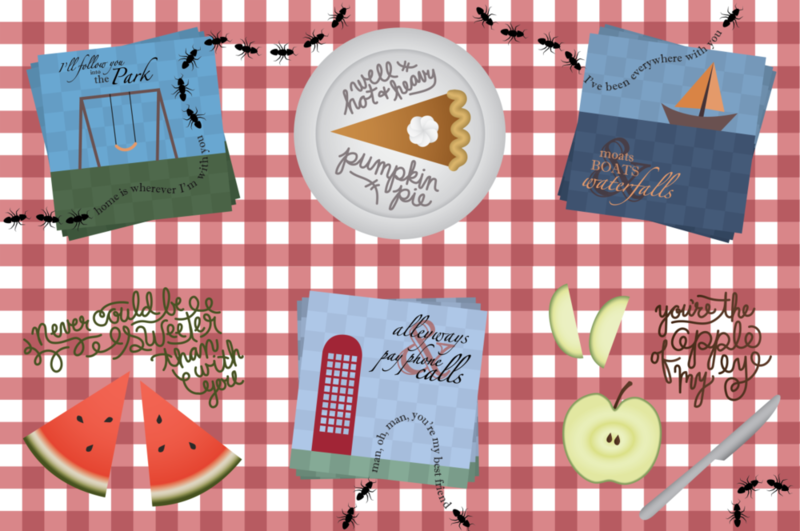 Since common picnic foods are mentioned in the song, it made sense to spread them all across a picnic blanket pattern. Each of the fruits is cut into pairs to imply that two people are eating them on their date. For the lyrics that could not be illustrated as foods, they are instead shown as scenes on stacks of napkins with the words appearing to be printed on top. The napkins are designed with checkerboard patterns that mimic their background and serve as a grid for the flat objects and scripted type. In contrast, the organic objects are treated with gradients to make them look more realistic, and their related text is handwritten in an imperfect cursive script that reflects the informal tone and the personal nature of the song. Along with these elements, the playful color palette helps emphasize the friendly mood. Finally, each section is organized into a 12x12 grid stitched together by the trail of ants that breaks each border and brings the design into a continuous pattern.